The National Wildlife Federation just recently certified our property as a wildlife habitat. It is well know how the NWF helps protect wildlife by being America’s largest conservation organization. The National Wildlife Federation works with more than 4 million members, partners and supporters in communities across the country to inspire Americans to protect wildlife for our children’s future. 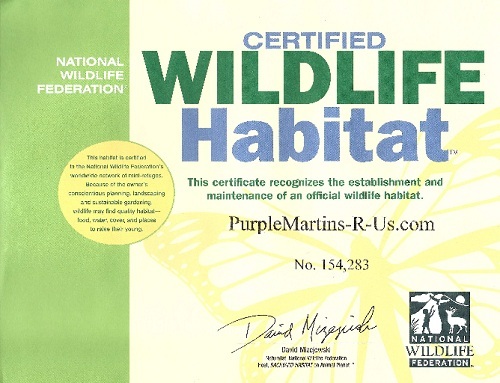 By certifying our site we have shown our continued effort to provide food,water, cover and places for wildlife to raise young, not only for purple martins but many other animals that call our yard home. Our property, at almost 1.4 acres is not only home to our 45 some odd pairs of purple martins, but a family of screech owls and wild rabbits. Not to mention the assortment of birds that visit our bird feeders and water fountain. 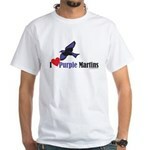 And speaking of purple martins, no nest building of yet, but I expect that to begin anytime. Almost all compartments are taken except by either ASY pairs or singles. The only compartments that have not been taken are a few compartments in the aluminum houses and the shepherds hook gourds. The shepherds hook gourds are simply a few gourds that I hang up on plain old 5 foot shepherds hooks and every year they get taken also. No SY birds have been seen yet, in any State, but they aren’t too far behind.